On Tuesday, December 13, the Senior School held their traditional candlelight ceremony in honour of peace, joy, love, and hope. In keeping with “Not for Ourselves Alone”, the Senior School students brought new socks to share with Covenant House of Vancouver, an organization that supports vulnerable youth in the city. Through various readings, musical performances by our vocal ensembles, and the lighting of four candles, we were reminded of all that we have to be thankful for. Mrs. Harvey, Director of Senior School, focused on slowing down and enjoying the holidays. She encouraged students to look back on past holidays and, whether they are staying close to home or going somewhere exotic, to take the time to truly enjoy being with family and friends and to take time for themselves. Speaking on the importance of family and gratitude, Ms. Gionet, Head of School, shared a poem and a quote with students. Our Community Service Captains reminded us that gratitude is, in fact, the greatest gift of all. See photos from the Candlelight Assembly below. The Junior School held their traditional Candlelight Assembly on Friday, December 9. This annual celebration of songs and readings is led by our Grade 7 students, and includes the lighting of candles for joy, faith, hope, love and peace. The assembly reminds us what this time of year is really all about. York House supports the Family Services of Greater Vancouver, a non-profit organization dedicated to helping families and children in need. Students in Grades 1-3 brought a gift which is placed under the tree at the beginning of the service. These gifts are used year-round for children who are in their Emergency Foster Care Program. Students in Grades 4 to 7 contributed to the Holiday Hamper Project where each class was assigned a family in need. Jennifer Ford Sharpe joined us in September as our Junior School STEAM Coordinator and some exciting things have been happening since then. Jennifer received her Master of Arts in Contemporary Art from Sotheby’s Institute of Art in London, England and a Masters of Arts in Child Study and Education at the University of Toronto. Prior to joining York House, Jennifer has applied STEAM throughout her career including as a visual arts teacher at the Mabin School, as an Environmental and Sustainability Education Graduate Assistant at Ontario Institute for Studies in Education (OISE), as Education and Communications Coordinator at the Peggy Guggenheim Museum in Venice, Italy, and more. And what is STEAM you may ask? STEAM is the acronym for the merging of the academic disciplines of science, technology, engineering, art and design, and math. Some people may be familiar with STEM, which was simply missing the “art and design” component. STEAM encourages the core competencies of creative and critical thinking, collaboration, communication, and positive personal and cultural identity. Grade 1. Not A Box – After reading Not a Box by Antoinette Portis, students were given the creativity challenge to imagine their shoebox as anything but a shoebox. 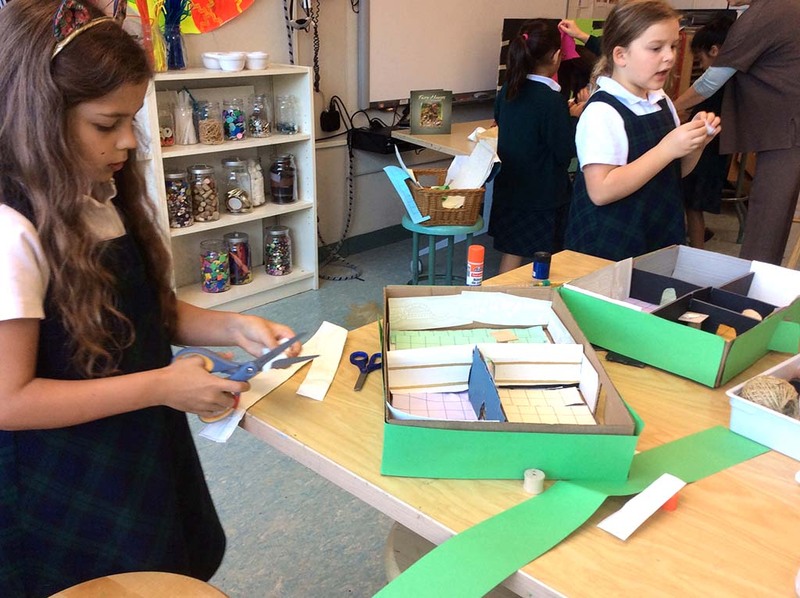 After creating three plans for their “not a box”, students were given a range of materials to help their creations come to life. This activity truly encouraged out of the box thinking! Grade 3. Fairy Home Design: Inspired by author Roald Dahl’s book, The Minpins, Grade 3 girls worked in pairs to create their fairy homes. Extending their interest in our new, York House Fairy Garden, students imagined what the inside of the fairy homes should look like. This STEAM challenge explored math concepts of measurement and spatial awareness. They used their math skills to calculate the area and perimeter of the house and each room. Students went through the design thinking framework to ensure their homes served the needs, wants, and behaviors of the fairies. Grade 4. First Nations astronomy: To extend the Grade 4 Social Studies unit on First Nations people and the science unit on astronomy, students will soon be looking at the First Nations legends of astronomy. Students will create stop-motion animations illustrating both a traditional first nations story and the actual process of celestial bodies moving. The hope is that students will show the value in knowing both ways of looking. Grade 5. Cardboard Arcade: Inspired by the video Caine’s Arcade and the global Cardboard Challenge held on October first. Grade five students created arcade games for the Grade 1 students made completely out of cardboard and recycled materials. To design the toys, they went thought the design thinking framework – empathizing with the Grade 1s, ideating a number of possible games, and prototyping. Next they shared the games with Grade 1s, and made modifications based on their feedback. Students had to empathize with their users, ideate all possibilities for games, and then create their prototypes. And let’s not forget the magical Junior School foyer transformation that happened only a couple of weeks ago. Our Grade 5–7 Art Club, and teachers, Ms. Sharpe and Ms. Jurgensen, were inspired by a Shantell Martin video to create black and white line drawings and doodles to cover the light fixtures, cushions, walls, and table. They measured the space and objects first to ensure that the paper fit exactly. 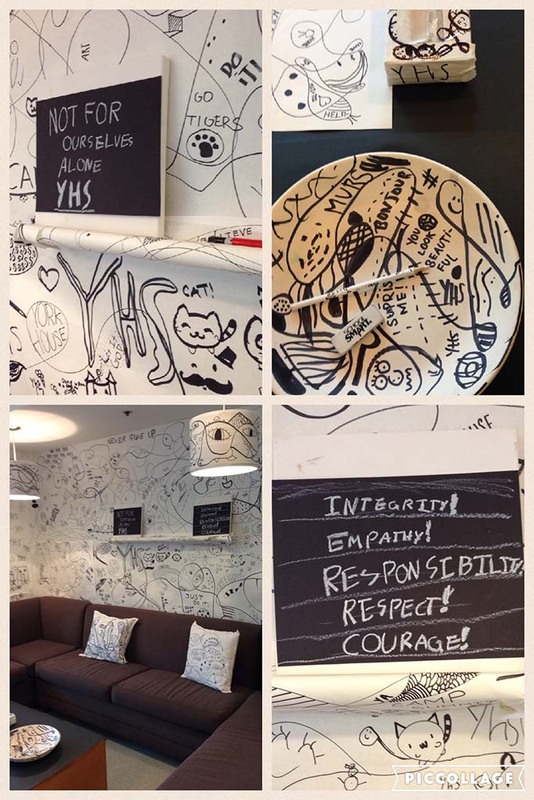 Our York House Core Values inspired the doodles and they managed to complete the whole project in 1 hour! Students learn to generate creative ideas through the act of ideating and bring those ideas to life so that others can experience their vision. By empathizing with the user, students become conscious on how their design will effect another. Students make and test prototypes, learning to adjust designs through trial and error. Maker education encourages students to learn through experience and the basic human impulse to create and solve problems. Students engage in a wide range of hands-on activities from traditional crafts to digital technologies. 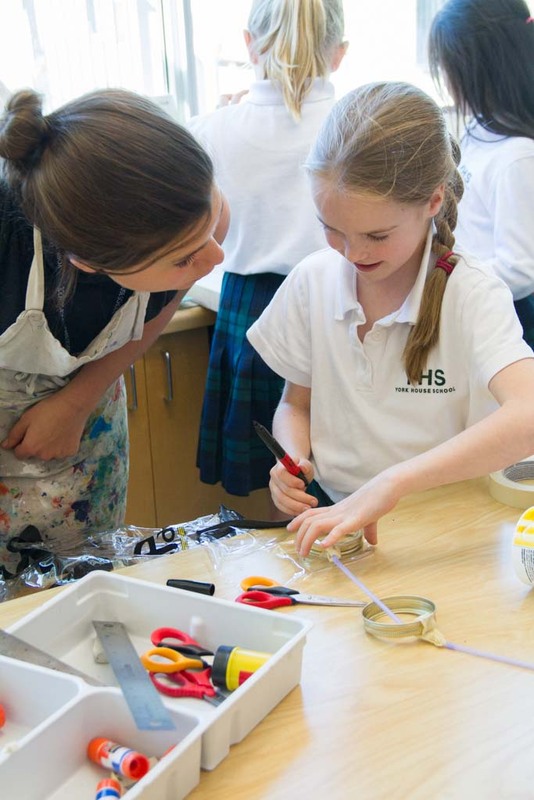 Building, creating, and experimentation will support academic learning and extend students’ interests. 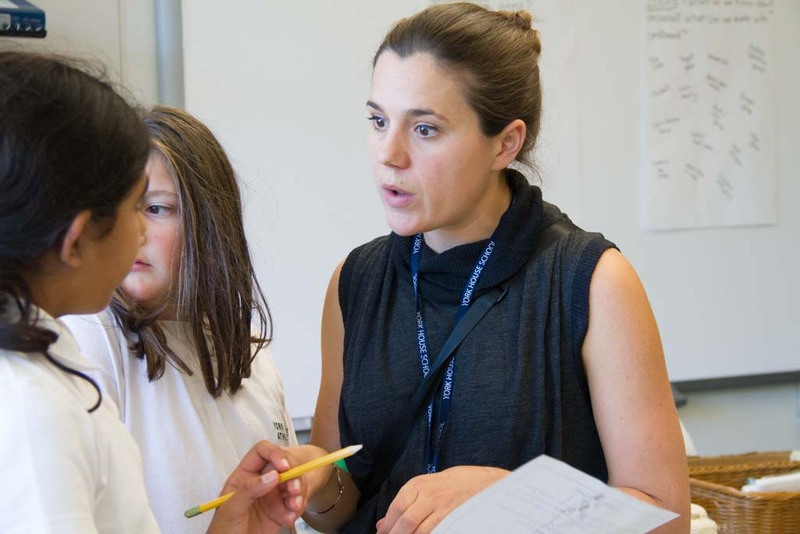 Students actively explore real-world problems and challenges. By working on long term inquiries, students will acquire a deeper knowledge and become invested in making a difference in their community. Digital technology is incorporated in meaningful ways to enhance learning. Coding, fabrication, research, photography, and video are incorporated into programs and units of study.